Working on the blog up here in Maine, I keep seeing logging trucks go by day after day, and the kids always get a kick out of the massive load of logs that get trucked out even in the snow. 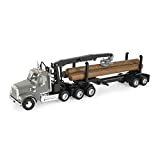 There are few toy manufacturers that are putting out some great logging toys, with some even having a fully operational claw truck to go along with your toy skidders… For that realistic loading zone site that kids love to create, and build their own mini forestry operation. The Peterbilt cab features lights and sounds, opening doors and adjustable Mirrors. 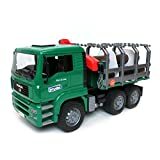 A fun realistic and durable loading truck that can be used indoors and outdoors. 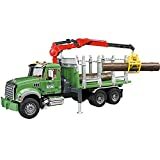 Multiple moving parts for the most realistic play; extendable crane swivels, hook to load unload logs, tilting flatbed, fold down gates and hood opens to reveal engine. Realistic sounds to enhance play time. 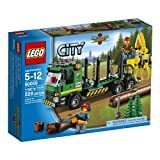 A great item for the little Logger as well as the collector. Man the crane controls and load up the logs! Cut up the logs with the chainsaw! Dimensions L x W x H (in. 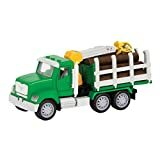 ): 14" x 3 5/8" x 4 1/2"
The Air Pump Logging Truck from Dickie Toys is a toy vehicle that gives an innovative insight into this exciting industry. The wood transporter has an articulated crane arm with a pneumatic air pump feature which works by pressing a knob or operating a lever - completely without batteries. 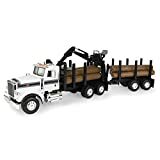 The Freightliner truck is supplied with a wood waste container and plastic logs. The innovative technology makes the truck and children learn about various physical principles at an early age.